Southern Illinois University Edwardsville alumna Catherine Ross-Cook is among 10 Illinois teachers to receive the prestigious Golden Apple Award for Excellence in Teaching. The annual award recognizes and honors outstanding teachers for their role in building a stronger, better-educated society. 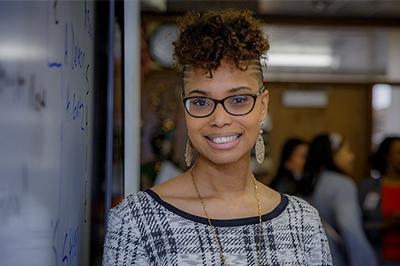 Ross-Cook teaches at Homewood-Flossmoor High School in Flossmoor. She earned a master’s in American and English Literature from SIUE in 2005. Golden Apple surprised Ross-Cook with an award presentation in front of students, faculty and school leaders. Photos and video from the surprise announcement show Ross-Cook’s exuberance, as her students look on with delight. According to Golden Apple, award recipients are selected by master educators who understand and recognize instructional best practices and who utilize professional standards to evaluate exemplary teachers and school leaders. Members of the selection committee viewed video evidence of instruction and observed finalists’ teaching in-person. The 2019 award recipients will be featured on a Public Broadcasting Service (PBS) one-hour television program. The livestream of the show will air on Golden Apple’s Facebook page on Saturday, May 18. For more details, visit www.goldenapple.org/awards.